Cologne - It was on a cold December night last year that Pep Guardiola and Thomas Tuchel enjoyed a very animated tete-a-tete in a popular Munich bar. The topic of conversation? Tactics. 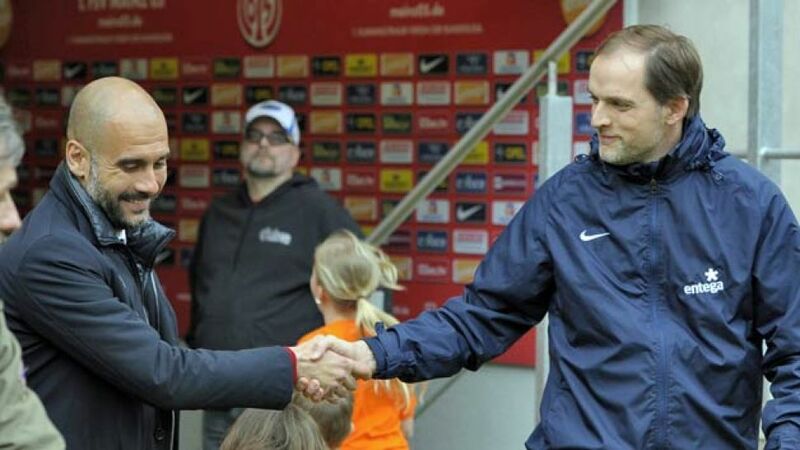 Guardiola was midway through his second season in charge of FC Bayern München, while Tuchel was on a sabbatical year after stepping down as 1. FSV Mainz 05 head coach in May 2014. If reports are to be believed, the two strategical pedants used salt and pepper mills to convey their gamut of ideas in a veritable meeting of football minds. Tuchel, by his own admission, has long been an admirer of Guardiola’s distinctive philosophy. At Mainz, he set his team up according to the task in hand, but was never afraid to tinker mid-game. He pursued refinement, perfection and sought solutions to problems that, to outsiders, did not exist. To all except a certain Catalan of a like-minded persuasion, that is. Yet while Tuchel was busy bringing the very best out of a modest Mainz side that had only returned to the Bundesliga in 2009, Guardiola was fastidiously laying down the foundations for what became a much wider-reaching legacy at Barcelona. In the space of four decorated years comprising 14 domestic, European and world titles, he went from local hero to world football icon. "Guardiola is the best, even if he doesn’t like to admit it," Tuchel told journalists ahead of Sunday’s Der Klassiker between Bayern and Dortmund - his first such encounter since replacing Jürgen Klopp in the BVB hot seat last summer. "His time at Barcelona really left a lasting impression on me. As a fan I learnt so much. Barcelona under Pep was the benchmark for me." A champion of homegrown talent with a reputation for passing opposition teams into submission, Guardiola has underlined his status as modern football’s greatest thinker in Munich. Ambition personified, he returned from a year’s reflection to take over a team that had just won the treble in 2012/13 under Jupp Heynckes. Although he is yet to match that historic feat, the 44-year-old continues to mould and evolve the side in his own inimitable way. Following back-to-back Bundesliga title wins, Guardiola’s class of 2015/16 are playing with greater flexibility, unpredictability and harmony. Bayern have won all ten of their competitive outings since losing the Supercup on penalties to VfL Wolfsburg on 1 August, and will become the first team in Bundesliga history to open a season with nine straight wins if they can overcome second-placed BVB this weekend and SV Werder Bremen on 17 October. For Tuchel, it is his sternest test yet as Dortmund head coach. Naturally, the Krumbach native has downplayed his chances ahead of the Bundesliga’s 93rd instalment of Der Klassiker, but he would not be where he is today if he did not have something fresh up his sleeve to get one over on his great Catalan muse. He is a self-professed disciple of the Guardiola school of thought, after all.